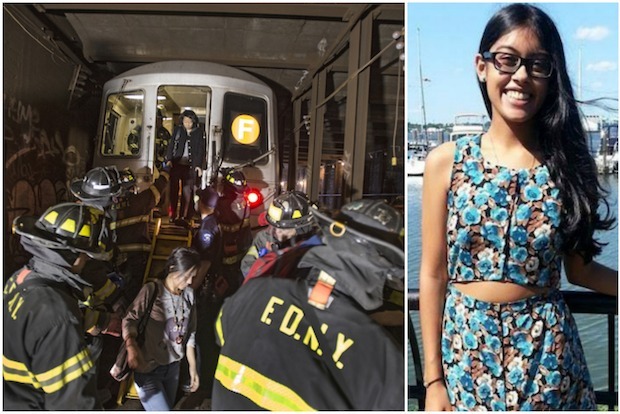 KEW GARDENS — A Hunter College student who was aboard the F train that derailed in Queens in May plans to sue the MTA, claiming she has been too scared to take the subway since the incident. Jolted straphanger Melanie Chandan said she injured her knees, arms, head and neck when the Brooklyn-bound F train jumped the tracks in a tunnel near the 65th Station in Woodside and violently came to a halt, throwing her forward in her seat. But the 19-year-old Kew Gardens resident said that the crippling panic attacks she has suffered since the May 2 incident are far worse than any physical pain. "I can't bring myself to ride the train," Chandan, 19, told DNAinfo New York. "I even get upset by [hearing] the rumblings of the train." Chandan's lawyer, Rehan Nazrali, filed a notice of claim against the MTA and the city on July 16. The notice is the first step in filing a lawsuit against a government agency. "It was an ordinary day in New York, and then all of a sudden her ordinary life was turned upside down," Nazrali said of the derailment. "It was totally unnerving — something that's so reliable becomes entirely dangerous." Roughly 1,000 straphangers were on board the F train when it derailed at about 10:30 a.m. SIx of the F train's eight cars were knocked off the tracks and 19 people were injured, including four who required treatment at a hospital. On the day of the derailment, Chandan was taking the F to Hunter College. The teen said she was sitting with her headphones on and using a tablet when "everything started to shake and the lights flickered." "The train moved violently from side to side," she recalled. "It felt like the car was lifted off the ground." Chandan said she was flung into another seat by the jolt. She remembers there being very little light in her car, passengers screaming and train operators telling everyone to remain calm. As they waited for rescue workers to come, passengers shared water bottles and tried to reassure one another, Chandan said. "A few people were having panic attacks and we were able to calm them down," she said. She said she and other passengers were stranded underground for three hours before rescue workers led them out of the train and up to the surface. Since the derailment, Chandan said she hasn't taken the subway. "I haven't been in the city since the end of May," she said, noting that she now sees a therapist. Nazrali said Chandan ended up withdrawing from two college classes because of her panic attacks. "She hears noises, sounds and flashes — all those things that go with being a victim of a bomb scene," Nazrali said. "Her mother will tell you, 'She's not the daughter that I knew.'" The MTA declined to comment on the pending litigation. An agency spokesman said the derailment is still under investigation and no cause has been determined.